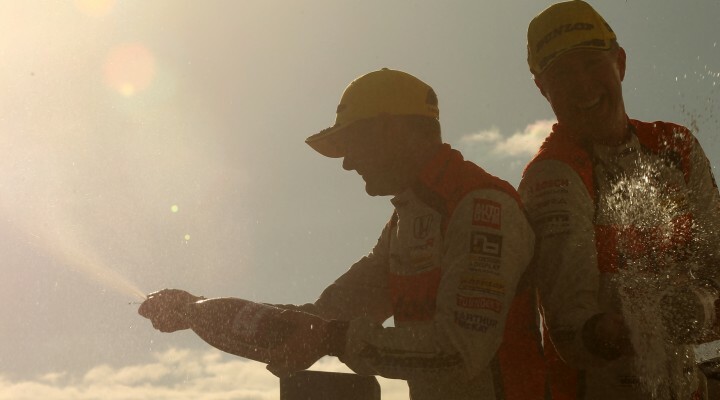 Mat Jackson, Rob Collard and Matt Neal made it six different winners from the opening six 2016 Dunlop MSA British Touring Car Championship races, as the country’s biggest motor racing series produced an exciting and unpredictable triple-header at Donington Park. Motorbase Performance’s Jackson won a breathless first race after muscling his way between MG Racing RCIB Insurance’s front row starters. Jackson pulled away from the MG duo and was more than a second up the road at the midway stage. Cook was equally comfortable in second, while Sutton was fending off fellow slow-starter Tom Ingram for third. The Speedworks Motorsport man ran side-by-side with Sutton as they crossed the start/finish line on lap 11 before making the move stick through Redgate to claim the final podium position. The race headed to a dramatic conclusion in more ways than one as Matt Simpson and Daniel Welch made heavy contact at Coppice, whilst the Subaru of James Cole burst spectacularly into flames in a completely unrelated incident. With just one lap to go and three cars littering the circuit in dangerous positions, officials were left with no option but to red flag the encounter, handing Jackson a deserved win from Cook and Ingram. BMW machinery then joined Toyota, Honda, Mercedes and Ford among the BTCC winners so far this season, when Collard took an impressive victory in race two. That prospect had looked some way off with WSR’s Collard starting from sixth on the grid. The Team JCT600 with GardX driver blasted up to third on the first lap, but had to wait until lap 12 to make further ground as Ingram defended valiantly. Collard passed the Toyota Avensis with a tidy move at the final chicane and he immediately set about hunting down Jackson’s Duo-backed Ford, which had led from the start. Collard hauled in the ballast-laden Focus and the two cars ran side-by-side through the exit of Coppice in the closing stages, with Jackson eventually having to concede going into the Esses. The race one winner held on to take second while a sensational scrap ensued behind him for the final podium position. Cars ran four abreast at one stage as Sam Tordoff’s BMW bounced across the gravel, before his WSR team-mate Jack Goff tapped Ingram’s Toyota on the exit of the chicane. Tordoff lost out slightly while Ingram was shuffled way down the order, and when the dust finally settled it was Aron Smith who had snatched third for BKR – a second podium in as many BTCC weekends for the fledgling outfit. Honda’s Gordon Shedden and Neal sandwiched Goff’s BMW in fourth, fifth and sixth respectively, whilst Cook scored some valuable points for MG with seventh, despite both him and team-mate Sutton being demoted down the pack. Halfords Yuasa Racing took a commanding one-two in the weekend’s BTCC finale as Neal became the sixth different winner from the six races contested so far this season. Tordoff maintained the lead from pole position, and was followed by team-mate Goff on lap two, after he slipped by Neal’s Honda Civic Type R at the Esses. Reigning champion Shedden made his way through to fourth place, joining Neal in the quest to hound down the two BMWs ahead of them. Although the WSR cars initially scampered off into the sunset, both Tordoff and Goff had the tough task of managing their Dunlop soft tyres for the duration. It proved to be a race of two halves as the harder compound runners benefitted from greater performance in the latter stages, and fortunes subsequently swung back towards Honda. Neal sliced past Goff at the Old Hairpin on lap ten and Shedden followed suit at Redgate next time around. Although Tordoff desperately tried to look after his tyres, it became clear he was helpless to stop the Honda charge. Neal’s Civic Type R took eight tenths of a second out of the Team JCT600 with GardX BMW on lap 13 and he was through one lap later – making a textbook move at McLeans, one of the triple champion’s favourite hunting grounds. Shedden produced a similar move on Tordoff as he had done to Goff earlier on – again at Redgate – and the Hondas were suddenly holding a comfortable one-two. Both streaked clear to take the chequered flag in unison and the BMWs of Tordoff and Collard followed in third and fourth – the latter also benefitting from the consistent performance of the hard tyre. MG’s Sutton stormed through to take fifth ahead of the fading Goff, whilst Aiden Moffat took an impressive seventh, and with it the Independents’ win for Laser Tools Racing. The two Hondas of Neal and Shedden, respectively, lead the way in the Drivers’ standings after a strong set of results over the course of the weekend – culminating in that race three one-two finish. The two BMWs of Goff and Collard made ground to place third and fourth – Collard profiting particularly from his race two victory. Halfords Yuasa Racing heads the Teams’ table by 22 points. Team JCT600 with GardX and Motorbase Performance, who both gained significantly over the weekend, currently stand second and third. Honda also tops the Manufacturers’/Constructors’ standings from WSR. Aron Smith leads the Independent Drivers’ while Motorbase Performance overtakes BKR to top the Independent Teams’ table. Sutton again impressed, extending his advantage in the Jack Sears Trophy. Click here for the final classification from the Dunlop MSA British Touring Car Championship races at Donington Park. Matt Simpson was reprimanded and received two penalty points for an incident involving Rob Austin. Matt Simpson was reprimanded and received two penalty points for a further incident involving Dan Welch. Rob Collard was deemed to have gained an unfair advantage cutting across the grass at the start of the race and received a verbal warning. Matt Simpson received a verbal warning for an incident involving Kelvin Fletcher. As this was his third strike of the season he was deducted three points from his Drivers’ Championship total and demoted to the back of the grid for race three.